Like exercise, a diet plan for osteoporosis is key to improving bone health. Lets cover this and provide you a 12 point osteoporosis eating plan. So what exactly is a diet plan for osteoporosis? A bone healthy diet is about more than getting enough calcium and vitamin D.
While calcium and vitamin D are essential to healthy bones, strong bones require other nutrients and diet modifications as well. Let’s cover a 12 point osteoporosis eating plan. 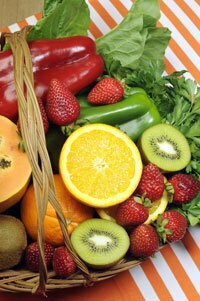 Includes nine or more servings per day of fruits and vegetables with two thirds of those being vegetables. Includes 25 to 30 grams of protein at each meal (3 meals per day). Meets protein needs for strength training as well. Is adequate in calcium with an emphasis on getting calcium from food. If that is not possible then only supplements at the level needed beyond what is not obtained from food. Avoids over supplementing with calcium. Includes good food sources of vitamin D and a supplement when necessary. Does not over supplement with vitamin D.
Severely limits or eliminates the use of processed foods, especially those with phosphorus containing additives. While phosphorus is an essential building block for bone, too much phosphorus resulting from a high intake of processed foods containing phosphorus food additives, can result in reduced calcium absorption. Is a varied diet that regularly includes seeds, nuts, legumes and whole grains, with very few to no refined grains. Meat and dairy products come from grass fed animals, when possible. Meat and dairy from grass fed animals are higher in Vitamin K2 than their grain fed counterparts. K2 is key to the body’s process of drawing calcium into the bones and incorporating it into the bone matrix. Includes good food sources of vitamin B12 and a supplement if needed. Limits alcohol consumption to moderate use and only if not contraindicated for other health reasons. Avoids excessive salt intake. Eliminates or significantly limits the amount of processed and high sodium restaurant foods eaten. Avoids drinking sodas, especially cola drinks. Includes consumption of adequate fluids. The added bonus is that when you eat bone healthy meals you are also eating a diet that reduces the risk of heart disease, Alzheimer’s and some cancers. Enjoy healthy eating – learn to cook delicious vegetables and even try growing some of your own so you enjoy the benefits of truly fresh veggies. I get the melio emails and low and behold when I was checking out some of the links I found your article. Nicely done!!!! A serving of vegetable is either 1 cup of raw greens or 1/2 cup of other vegetables. For example 1 cup of broccoli would be considered 2 servings of vegetables. A salad with 2 cups raw greens, 1/2 cup tomato and 1/2 cup carrots would be 4 servings. A serving of fruit is generally 1 medium size fruit or 1/2 cup fruit. Hope that helps. Your insight matches much of what I have learned as a plant based eater and cook. I too have a history of osteopenia and osteoporosis. Does your program have a plan for those of us who tend to be vegan and must be gluten free? Yes, plant based eating shares many of the same concepts. While my program includes lots of vegetarian meals, at this time my Food 4 Osteoporosis Eating plan is not vegan or gluten free. Some of the muffin recipes are gluten free but not all. Maybe someday I can expand the program to include a vegan and gluten free option as well. You might want to take a look at the free demo of one weeks menus on my website to get a better idea of the menus and recipes offered. Thanks for your comments. Yes, I 2nd Diana’s comments. I’m interested in a vegan, gluten-free menu, too.